A manual for not losing control of your life, discover how boundaries can lead to a more organised and fulfilling life. Need to regain control in your life? You'll discover firsthand how to reclaim your freedom to walk as the loving, giving, fulfilled individual God created you to be. To regain control of your life, you've never needed Boundaries more than you do today in today's always-on, always-connected digital world. Drs. Henry Cloud and John Townsend wrote the New York Times bestselling book on Boundaries – the personal property lines that define who you are and who you are not, and influence all areas of your life – physically, emotionally, spiritually. And now, over 2 million changed lives later, Cloud & Townsend have updated and expanded this bestseller with essential guidance for setting Boundaries in today's digital age. If you've ever wondered: Can I set limits and still be a loving person? How do I answer someone who wants my time, love, energy, or money? Why do I feel guilty when I consider setting boundaries? Unpacking the 10 laws of boundaries, Drs. Henry Cloud and John Townsend give you biblically based answers to these and other tough questions, and show you how to set healthy boundaries with your spouse, children, friends, coworkers, and even with yourself. In Boundaries, Drs. Cloud and Townsend show you how to bring new health to your relationships. You'll discover firsthand how to reclaim your freedom to walk as the loving, giving, fulfilled individual God created you to be. Boundaries by Henry Cloud; John Townsend was published by Zondervan in October 2017 and is our 3232nd best seller. 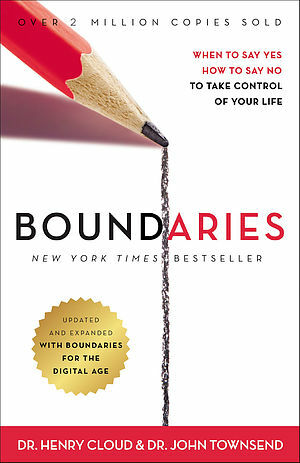 The ISBN for Boundaries is 9780310351801. Be the first to review Boundaries! Got a question? No problem! Just click here to ask us about Boundaries.